The Amish debuts tonight on PBS at 8 p.m. Eastern and Pacific, 7 p.m. Central and Mountain in most markets (check your local listings). The first title card of American Experience: The Amish lays out the difficulty of what director David Belton had to overcome to make this documentary in the first place: “The Amish will not pose for photos or be interviewed on camera.” That’s a pretty serious hitch in the documentary flow, but there are a couple loopholes. A handful of Amish men and women agreed to have their voices recorded, and, as a tour guide explains in the beginning of the section, pictures from farther away aren’t as much of a concern as close-up shots. 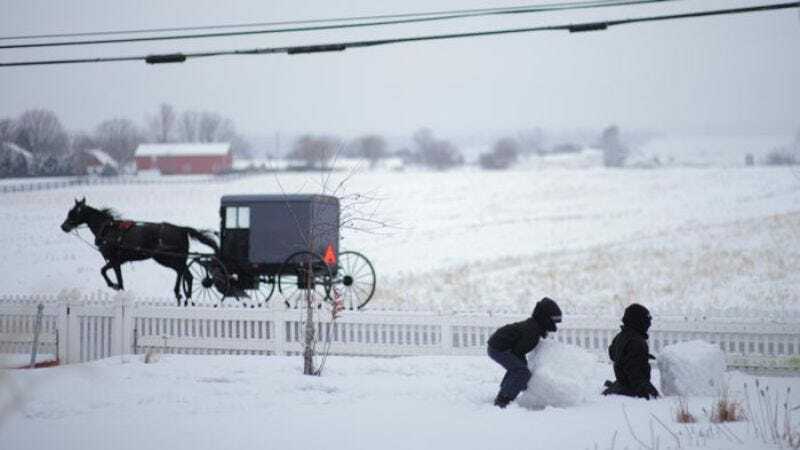 Most of the visual content of The Amish is far away glimpses of towheaded children in breeches romping through the fields and bonneted women filing up for church or doing the laundry in the wee hours of the morning, narrated by disembodied voices of anonymous Amish people. For a documentary that seeks to go beyond the surface of the Amish community, this often proves problematic. The glossy landscapes of pastoral life veer toward idealizing the Amish rather than helping outsiders understand them. Belton touches briefly on some of the difficulties in the Amish community: We hear from a woman who was abused by her husband, only to have the church ban her for speaking about it. Men who would prefer to be farming have been forced into factory work, leading them to question the future for their homes and churches. There’s a scene of a group of Amish looking to purchase cheap, arable land in Colorado, the purple Rockies sweeping over the black-coated men surveying their future with determined optimism. But, perhaps due to the difficulty of the subject, The Amish still keeps us at arm’s length from the people it sympathizes with. In the beginning, a title card informs you that 20 million visitors a year see the Amish country—which consists of only a quarter million Amish people. At the end of The Amish, you feel like you’ve joined the ranks of the spectators. The community you’re watching remains as distant as ever.